Las Vegas, Nev. – A new health care leadership survey released today by Royal Philips (NYSE: PHG; AEX: PHIA) reveals that a majority of health systems have already implemented population health management programs as they seek to improve patient outcomes. Additionally, driving measurable clinical improvements and ensuring interoperability remain the focus of health information technology (HIT) investments in 2016. These investments are focused on enhancing electronic medical record (EMR) functionality and connecting data across clinical systems within the health system to provide a broader picture of individual patients and better manage populations. Conducted by HIMSS Media on behalf of Philips and announced at the 2016 Annual HIMSS Conference and Exhibition, the survey of 105 health care IT leaders sought to determine how health leaders are prioritizing technology investments and addressing population health management. Of the 105 respondents, 85 percent represent either standalone hospitals or integrated delivery networks (IDNs). Three quarters of participants are in C-level positions or IT leaders, and 27 percent are clinically focused. Philips’s goal when building new technologies is to ensure everything can interoperate within the health system. Philips’ own portfolio depends on the free flow of an individual&apos;s health information from distinct systems. In fact, more than a dozen leading health care providers, hospitals, technology and consumer advocacy groups, including Philips, have agreed to implement federally recognized, national interoperability standards. For more information on the initiative, please visit >www.healthit.gov/commitment. The full text of Philips’ Interoperability Pledge can be found at HealthIT.Gov. As health care moves from being fragmented and episodic to being coordinated and continuous, population health management efforts are critical to making this transition. 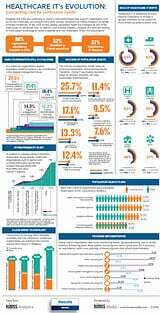 More than two-thirds of respondents already have population health programs in readmissions, acute care and patient education and more than half have chronic care programs. Notably, when asked where they planned to spend resources in the near future, respondents listed mobile wellness monitoring (52.5 percent), aging well (46.5 percent) and home monitoring devices (45.5 percent) as their top priorities. Care coordination is the biggest challenge organizations face in their effort to achieve population health management (23.5 percent). Other challenges include financial investment (21.4 percent) and data management (18.4 percent). Half of respondents plan to use cloud-based technology in big data analytics. Additional investment plans are focused on managed application deployment (41.9 percent), clinical data storage (39 percent) and health information exchanges (39 percent). More than half of respondents have focused their existing population health management investments on health information exchanges (57.6 percent), telehealth systems (57.6 percent) and analytics (54.5 percent). To see how Philips is already addressing all of these key challenges visit the Philips booth (#3416) at the Healthcare Information and Management Systems Society (HIMSS) 2016 Annual Conference and Exhibition, taking place Feb. 29 – Mar. 4, at the Sands Expo in Las Vegas, Nevada. For updates, follow @PhilipsLiveFrom or visit www.philips.com/HIMSS for more information on Philips’ presence at #HIMSS16.